KUALA LUMPUR (July 13): AirAsia Group today announced that it has ordered 200 additional CFM LEAP-1A engines to power the 100 new Airbus A321neos it is buying. In a statement today, AirAsia said the order, which expands its LEAP engine fleet to nearly 730 engines, is valued at US$2.7 billion (RM10.65 billion) at list price. "This order for the larger A321neo is an important element in our long-term growth and expansion strategy," said AirAsia Group chief executive officer (CEO) Tony Fernandes. "Choosing the right engine to power them is critical to the success of that strategy. For us, the LEAP-1A was the obvious choice. This engine has demonstrated the promised 15% fuel efficiency and we are quite familiar with the reliability inherent in CFM products and the impact that this has on our operations," he said. According to the statement, the agreement was signed by Thai AirAsia CEO Tassapon Bijleveld, representing Fernandes, and CFM International president and CEO Jean-Paul Ebanga at Grosvernor House Hotel. 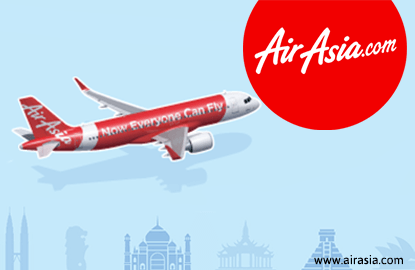 AirAsia has been a CFM customer for more than a decade. AirAsia was an early LEAP customer and placed its initial order for 400 LEAP-1A engines — the largest in aviation history at the time — to power A320neo aircraft in June 2011. The airline placed a follow-on order for 128 additional engines in 2013. As the single largest Airbus A320 operator in the Asia-Pacific region, AirAsia operates a fleet of 170 CFM-powered Airbus A320s, with 304 aircraft still to be delivered. Today, the airline and its subsidiaries operate close to 1,000 flights per day to more than 120 destinations in 24 countries. Yesterday (July 12), AirAsia Bhd said it signed a firm order with Airbus for the purchase of 100 A321neos. The deal was announced at the Farnborough Airshow by Fernandes and Airbus president and CEO Fabrice Brégier. Shares of AirAsia closed 4 sen or 1.47% higher at RM2.75 today, with 51.6 million shares traded, for a market capitalisation of RM7.65 billion. It was the second most-actively traded counter on the local bourse.